Or they might. If you're worried about your eyesight, check out my new post on Medicana. I'll tell you all about Macular Degeneration and what you can do about it. 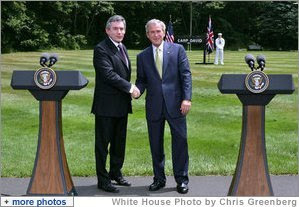 Q: Mr. President, what you think has actually changed with the arrival of Gordon Brown instead of Tony Blair? PRESIDENT BUSH: Oh, what's changed? He's a Scotsman, kind of a -- he's not the dour Scotsman that you described him, or the awkward Scotsman; he's actually the humorous Scotsman, the guy that -- we actually were able to relax and to share some thoughts. The "dour Scotsman?" As Jon Stewart quipped, why not the "pennypinching Scotsman"? Sigh...I can't even express the embarrassment I feel every time the man opens his mouth. Also? Did you hear about this? Yes, that's right, when you fly they're going to start tracking your ethnic background, religion, political views, sexual orientation, and more - supposedly to fight terrorism. It's an agreement the U.S. has just made with the European Union. First of all, I'd like to know how they will even find out any of these things in a typical airline transaction. "Sir, I have a few questions. First of all, did you pack your own luggage?" "Uh, why do you ask?" "OK, thank you. Are you a Democrat?" (Flight attendant marks passport with large black "X" and enters, in red, the word "Liberal" into computer). Do we really believe that our government will use this information only "where the life of a data subject or of others could be imperiled or seriously impaired," as the agreement states? Does anyone in their right mind actually trust the government to use this type of personal information properly? I thought not. This is a very scary time. And it is a long time until January of 2009 when we can finally get rid of this administraton. Too long. 539 days too long, in fact, but who's counting? Oh that's right - I am. (See my counter at the bottom of my blog). P.S. Thanks go to Hill Country Gal for posting this info on her blog - see her July 29 entry. Also check out her most recent post - lots of interesting news lately! I have finally gotten around to a) taking pictures of the new deck (now known as the Intrepid from my first view of its size when we returned from vacation and discovered it was bigger than we expected) and b) DH has finally downloaded them. So without further ado, here are a few views of our new deck now that we've added a few accoutrements and furnishings. It still has to be stained (we've chosen a natural cedar color) but that won't be done until the treated wood weathers longer. This is a view looking northward, showing the table and chairs we got for only $99 for the whole set (including the umbrella!). It came in one big flat box and its contents were made in China, probably by underage children in a sweatshop. I feel guilt, but not enough to have not bought the set. Here is a view in the other direction. This view shows the built-in bench along the back rail. We got this idea from the cottages we stay at in Cape Cod. One of the cottages has a small deck overlooking the lake, and it has built-in benches like this. So when we had our carpenter build the deck we showed him a picture of the bench and he did it the same way for us. Note how much Diva enjoys "her" deck. This is a view of the side steps - there are two stairways; one goes toward the front of the house and one to the back yard. This is a view of the other set of steps which leads to the driveway side of the house. So that's our deck! We are really enjoying it and wish we'd done it sooner! It has become a little haven for us, sort of like an outdoor room. Every morning we come out and sit outside and have our breakfast, and we are eating dinner outside as well. We used to eat outside fairly often even when we had our patio (which was farther out in the back yard and was actually the defunct cement floor of a long-gone garage). But somehow once it got dark we were less apt to eat out there or sit for any length of time. Now that we have the deck it is a cozy spot for us, and mosquitoes are kept at bay by lighting citronella lanterns all around the railings. It is hard to imagine that in a few short months there will be snow on the deck and we can no longer sit there. It's going to be an even longer winter than usual! And then it hits you. You will never be able to wear cool shoes like that again. You will never be in style again. When you buy low-riding pants (formerly known as hip-huggers in your youth) they fall down when you try to walk, being pushed down by the weight of your stomach. You can't wear regular jeans anymore because for some reason they are making them all just too tight in the waist. So you have to buy those jeans with the elastic stretchy panel in the waist in order for them to fit properly. This means you can't tuck in your shirts, so you wear overblouses. And you top off the whole look - or should I say, bottom off the look? 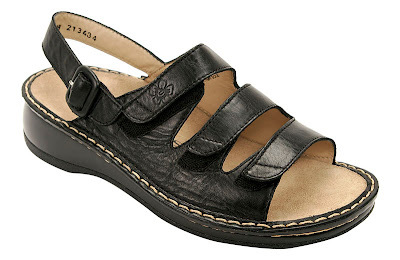 With orthopedic sandals. Yes, middle age has arrived. You can't fight it. You might as well enjoy it and accept it for what it is. The good part of middle age is you're no longer insecure, because you don't care anymore if you look great as long as your clothes are clean. Your husband loves you anyway and your friends and you have a great time together. The pressure is off and life is good. You feel better about yourself than you ever did back when you were 20-something, and you wouldn't go back to being that age for anything. 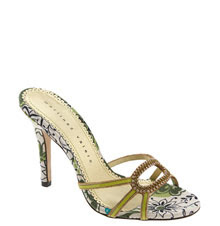 But once in awhile it would be nice to wear cool shoes. I have been avoiding this subject because even thinking about the suffering of the dogs that are embroiled in the shameful, vicious "sport" of dogfighting makes me literally ill. The night the news broke that Michael Vick of the Atlanta Falcons had been involved with dogfighting, I was at a bar watching our favorite Irish band, and the television kept showing pit bulls fighting, over and over. I couldn't watch, as the dogs were covered in blood, and all I could think of was my sweet Diva, and imagine it happening to her. The segment, which ran on ESPN that night, showed people walking into stark kennels where the pit bulls were kept, recovering from their wounds, and obviously in a state of malnutrition. In a heart-breaking display of the invincibly trusting nature of these dogs, some of them wagged their tails when they saw the visitors. I have finally decided to post on the subject, as I came across a well-written article on CNN that talks about this case, and it raises some interesting points. "The essential characteristics of the American Pit Bull Terrier are strength, confidence, and zest for life...This breed is eager to please and brimming over with enthusiasm. APBTs make excellent family companions and have always been noted for their love of children." This is a perfect description of my dog. She is the epitome of a well-bred American Pit Bull Terrier and lives up to this description every day. (OK, she can be bossy and loves to tell us what to do. But she hasn't a mean bone in her body - she loves everyone). The article also rightly points out that every generation has had its "devil dog du jour." Back in the 1970's I remember it was Doberman Pinschers that had the bad reputation, because they were often used as guard dogs and people were breeding them for aggression. I worked at the Associated Humane Societies in Newark, NJ, back in the '70's and at that time the Director of the Society had a Doberman and he loved the breed. Being a city shelter, the AHS got a lot of Dobermans, and, similar to today with pit bulls, they were hard to adopt out. The Director always made a special point to keep the adoptable Dobermans from being put to sleep and feature them in the magazine because of his love of the breed, and because of their mainly undeserved reputation. Now, the American Pit Bull Terrier, once America's favorite dog, is in the same situation as the Doberman was in the 1970's. Too many people have abused them, too many people have raised them without understanding the breed, too many people have bred them with poor bloodlines or purposely tried to make them into aggressive dogs. So even though these poor examples of the breed still make up a very small percentage of the overall population, they are the ones that get the media attention and make the breed's reputation suffer. The vast majority of the pit bulls that are in shelters today would make great pets. Most responsible shelters temperament-test these dogs before adopting them out, and if they are found to be aggressive, they do not get adopted to anyone. Probably some of them were rejected from the criminal life because they're just too nice, and that's why they ended up at a shelter. Others may have been turned in because they were just "too much dog" for someone who didn't have the patience to train them. Sadly, there are so many that will never get adopted, because people are afraid of them, or aren't sure whether they can trust them, or live in areas that have breed-specific legislation that prohibits ownership of these dogs, or puts prohibitive conditions on owning them. So many great dogs will languish forever in a cage or be put to sleep due to the misconceptions about their nature. I do not believe BSL is the answer to the problems that stem from irresponsible owners, irresponsible breeders, and criminal activites involving these dogs. No, I feel the way to get at the problem is to crack down on the illegal activities that aggressive Pit Bulls are being bred for: As attack/guard dogs for drug dealers and as fighting dogs. Dogfighting is illegal. But until now it's been a shadowy underworld that is generally ignored. But now with the Vick case, it is out in the open. Not only are people now aware of the problem, but it has hit the "big time." This is a famous NFL football player who was involved in this disgusting world. Recently I read in our local newspaper about a dogfighting ring that was broken up in Newark. I hope this is just the first of many crackdowns, and that Michael Vick's arrest will be the catalyst for cleaning up the underworld that is spawning the abuse and cruelty toward a steadfast, loyal breed of dog that deserves a lot better treatment at our hands. I can only hope that the publicity doesn't have the reverse effect and, for some misguided people, cause dogfighting to be glamorized instead of reviled in their minds. I guess we will have to wait and see. In the meantime, if you want to learn more about the American Pit Bull Terrier, please go to the Animal Farm Foundation website, or click on any of the other Pit Bull advocacy links I have on my righthand sidebar. We used to sing this in my Girl Scout troop, along with such other classics as “Rise Up O Flame,” and “Fires Burning,” all of which were sung as rounds, around the campfire. My mother was our leader and she loved music and singing, so we were always doing things like this in our troop. The funny thing is, I still know all the words to those three songs. And I’ve always felt particularly attached to the “Make new friends” song, because it is so true. I’m the kind of person who never gives up on a friendship. If I lose touch with someone it’s because the other person didn’t write back, or stopped sending the holiday cards, not because I did. I have friends from every stage of my life who are still part of my life now. I have a friend from 8th grade, three from high school, and three from college. I am still in touch via e-mail or cards with all of them, and still see two of the high school friends and all three college friends in person on a fairly regular, if infrequent, basis. But I had one friend from my years after college whom I had lost touch with over five years ago. And she wasn’t just any friend – she was the friend who introduced me to my husband. In fact, they were friends first, so we go back a long way with her. DH and I had stayed close with our friend throughout her short first marriage, and well into her second. We are the godparents of her son. But after about twenty years of friendship, we somehow drifted apart, and suddenly the time had gone by and we hadn’t seen each other, or our godson, for way too long for it to be resolved by a casual phone call…it had become one of those awkward things. The thoughts went through my mind, “Is she mad at me? Did I do something to offend her? Does she just think we’re boring?” And I eventually did give up on her after e-mails weren’t answered and holiday cards weren’t reciprocated. But it weighed on me. She had been so much a part of our lives for so long, that it was very strange not to be in touch with her and her family anymore. Then something happened to give us the opportunity to rekindle the friendship. Our godson became best friends with the son of our friend who lives down the street from us. They happen to be the same age and were involved in activities together, and became fast friends. Star Trek advanced a theory in one of their best episodes, “The City On the Edge of Forever,” that time has a shape and direction to it. As Spock said, “There is a theory…There could be some logic to the belief that time is fluid, like a river-- with currents, eddies, backwash.” In the episode, because of the “currents in time,” Spock and Kirk are able to go back in time to find Dr. McCoy, who had ended up on 20th Century Earth through a time portal and had changed history. I have seen so many examples of this happening in real life that I can’t help but think there is something to it. Currents in time somehow got our neighbor’s son together with our godson, and gave us the opening to renew our friendship with his parents. We started seeing our godson fairly often since he was hanging out on our street with our neighbor and her son. He is now a young man of 14, several years older than we had last seen him. I figured sooner or later we would see his parents again. And, finally, this past weekend, we were both down the street at our other friend’s house and our godson was there and his mom was coming to pick him up. So we lay in wait until her car arrived and then we came out to see her. She and her mother were in the car and I hugged her, and it was as if no time had passed (although DH and I are both a lot grayer than five years ago!). The ice was broken and now we plan to get together. Our friend is like a vortex in that river of time – without her, DH and I would never have met; and as a result, two other friends of ours would never have met THEIR husbands, one of whom is my husband’s best friend. An awful lot of people’s lives would have changed if we’d never known her. There is a lot of value in keeping friends from our past. It is more than just the camaraderie and joy of the friendship itself. As you get older, fewer and fewer people are left who remember who you were many years ago. Our grandparents pass on, our parents pass on. Eventually our friends and our siblings are the only ones left who can remember who we were, way back when. Without our friends, who would still remember that we were young once? And be able to reminisce with us about those days? I’m glad that I have another chance to have my friend back. We may be different now than we were 25 years ago; we may not have all the same interests or priorities in life. But we know who we are and where we came from, and we remember the laughter, the tears, and the experiences we shared. And now we can continue to share new experiences as our friendship moves into yet another phase in our lives. DH has reminded me that I should give credit to author Harlan Ellison for writing the original "City on the Edge of Forever" Star Trek episode. Funny bit by Jay Leno. Enjoy! I have discovered so many new blogs that I enjoy reading that I realized my "Links I Like!" list was getting a bit unwieldy. I was mixing in all kinds of different types of blogs that caught my fancy and that I read faithfully nearly every day. However, it occurred to me that if someone was reading my blog mainly for the occasional political content, they might not enjoy some of my other links; conversely, some who read my blog for the other content might be offended by the political points of view. In the beginning, I shied away from discussing politics because I was so new to the blogging world and didn't want to alienate half my possible meager audience. But as I have gone along, I realized I can't keep a lid on it forever and have ventured into the world of politics. Those who are reading my blog now know that I am a liberal and a Democrat, so there's no point in burying it under a bushel, as the saying goes. Therefore I have broken out the political blogs and bloggers that I enjoy and put them under a heading called "Politically oriented links I like!" (A bit awkward in its phrasing but I'm aiming for consistency here.) 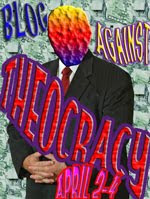 And I've added a couple more - Blue Gal, and Blog Against Theocracy. I'm sure I'll be adding more as time goes by. Secondly, I like medical blogs. So, I've moved some of the links that pertain to mostly medical subjects (both serious and not so serious) to a separate category called "Medically oriented links I like!" That includes my own "Medicana." I hope those who enjoy these subjects will like delving into these blogs. I've added two new ones by Femaildoc: Denver Doc Online and Doc of Ages. Very informative and interesting, especially for people like me who are fascinated by medical subjects of all kinds. So that's it for now! If anyone is checking the link list and thinks I've deleted their link please check the other link lists and you will see it is still there. I'd be interested to know, from more experienced bloggers, whether this idea of categorization is a good or bad idea for my blog or those I am linking to. If it is considered not so good an idea then I can always change it back. Blog Blond? Any advice? No, not MacDonald's. I'm talking about the return of "oldies" radio to the New York metropolitan area. WCBS 101.1FM was "the" oldies station in our area for years. All the old DJ's from the hit AM radio station I grew up with, 77 WABC (now talk radio), migrated over to 101.1 and lived on throughout the later 70's, the 80's, 90's and beginning of the 00's. Cousin "Brucie" Morrow, Harry Harrison, and more, continued to play the music my generation grew up with. I didn't always listen to it; sometimes they played a little too much of the 50's music that I wasn't as fond of. I alternated between CBS and an eclectic mix of classic rock and public radio stations that featured folk and alternative music. But I always knew CBS was there like an old friend, and all I had to do is switch to 101.1 and I'd hear the voices I grew up listening to, and the music that was the background to my youth. Then one day about 2 years ago, it changed. CBS abruptly switched over to a format called "Jack." With no DJ's, no call-ins, no personality, the station was playing a mixture of music types that I couldn't even describe. It wasn't offensive or hard on the ears; it just did nothing for me. I occasionally read about CBS and how its new format was faring. I read how their ratings were sinking, and I kept thinking what a mistake they had made. But it didn't occur to me they would actually bring back the old format. I listen to their sister AM station, CBS 88 Newsradio, and one day I heard them announcing that 101.1 was switching back to oldies as of that Thursday, July 12! So, on that day, I switched on CBS 101.1, and lo and behold, the oldies were back, and even better than before! Gone was the 50's doo-wop music. The format is now 60's, 70's and 80's - the exact timeframe that fits my age group! Now I hear my favorite songs as I'm driving to work. It's amazing how a song can bring back memories. Proust may have had his madeleines that sparked his recall of an entire thousand-page tome of memories. I have "Hang on Sloopy", "Summer Breeze" and "I Think We're Alone Now." "Hang on Sloopy" was my favorite song back in 1965 when I was about 12. I remember dancing to it at a school dance in 7th grade. I think I may have had the 45 (remember 45's?) but I don't know what happened to it. "I Think We're Alone Now," by Tommy James and the Shondells, came out in 1967, but to me it will always make me think of the Summer of '71 when two of my friends and I rode around in a '57 Chevy (I kid you not) with two older guys. The one who owned the car had an 8-track tape player and had the tape of the group's greatest hits. All I have to do is hear "I Think We're Alone Now," "Sweet Cherry Wine," or "Mirage," and I'm back in that old car careening around the New Jersey suburbs on a hot summer night with my friends and these guys. "Summer Breeze" was a big hit back in 1972 when I was in college. Everyone had the album and I remember lying out on a blanket in the "quad" in the May sunshine along with everyone else, studying for exams. Someone would put on Seals & Crofts' album in their dorm room with the window open and the speakers blasting the music out over the quad while we all tried to get some sun, slathered with baby oil, while studying at the same time. Almost every song from that era can trigger a specific time and place to me. Although they say smell is the one sense that triggers memories more than any other, I think music must be a close second. Ironically, shortly after I wrote the above post, I happened upon this article, which explains the reasons behind why our favorite songs are the ones we learn during our youth. Apparently, research shows that the human brain is at its peak from age 16-21 and absorbs new experiences best at this age. So now we know why we all have such fond memories of the songs of our teen and young adult years! I know many people have already commented on this issue, but I just had to chime in with my own two cents. According to the Chicago Sun Times and the New York Times, the White House said on Saturday that the President will veto Senate legislation to expand health care coverage for uninsured American children. The measure, which has bi-partisan support, would provide revenue to be used to expand an existing program, The Children’s Health Insurance Program, which is due to expire this fall. The purpose of the expansion would be to subsidize health insurance for those “with incomes too high to qualify for Medicaid but not enough to afford insurance on their own.” (Chicago Sun Times). The source of the revenue would be an increase in taxes on cigarettes. But of course, President Bush is against this. After all, we can’t have higher taxes on cigarettes. That would hurt his friends in the tobacco industry. “I mean, people have access to health care in America. After all, you just go to an emergency room. The question is, will we be wise about how we pay for health care. I believe the best way to do so is to enable more people to have private insurance. And the reason I emphasize private insurance, the best health care plan -- the best health care policy is one that emphasizes private health. 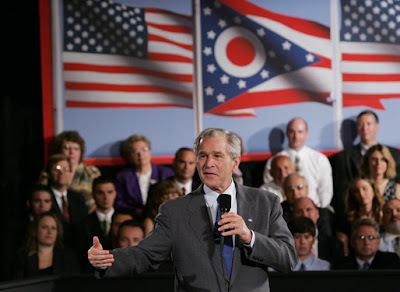 In other words, the opposite of that would be government control of health care.” (President Bush, speaking in Cleveland, Ohio). Hellooo? President Bush? These are the children of people who don’t HAVE private insurance and can’t get it; either they aren’t working, or they have jobs with no benefits. And no one is saying that the government would be in control of health care. The government would help subsidize health insurance for these uninsured children, which is not government controlled health care at all. Everyone knows that going to the emergency room for everyday medical problems is a terrible idea. It clogs up the emergency rooms, causing unacceptable waiting times for people with true emergencies; it is costly and inefficient. The costs are then passed on to everyone else. And worse yet, it does not provide preventive, ongoing medical care for the most vulnerable members of our society – our children. “The proposal would dramatically expand the Children’s Health Insurance Program, adding nonpoor children to the program, and more than doubling the level of spending,”Mr. Fratto said. “This will have the effect of encouraging many to drop private coverage, to go on the government-subsidized program.” (The NY Times, July 16, 2007). First of all, how could the program “encourage many to drop private coverage” when the program would only cover those who don’t have coverage in the first place? Secondly, these “nonpoor” children are not exactly rolling in wealth. Not like President George W. Bush and his cronies. “W” has no idea what it’s like to live in the real world. He was born into money, his family gave him every job he ever had, he never had to work for a living, never had to choose between spending money on food or medicine, never had to wonder where the next dollar was coming from. He never had to worry whether he’d have enough money to pay for his kids’ clothes. He never had to sit up with a sick child and weigh in his mind whether the illness was bad enough to bring the child to the emergency room or whether he could just wait it out and see what happened by the morning. He never had to worry whether the medical care he did get for that child was quality care or not. After all, he has had nothing but quality care from the day he was born. For him to say that people can just go to emergency rooms for care shows how out of touch he is with the ordinary people in this country. When Marie Antoinette said “Let them eat cake” when the people were begging for bread, she meant it; she wasn’t even trying to be nasty. She was so out of touch with her people that she didn’t understand that they did not have a choice between bread and cake. They only knew about bread. And they didn’t even have that. The people George W. Bush is saying should just go to emergency rooms don’t have a choice between emergency rooms and real medical care. But he doesn't see that. Marie Antoinette paid the price for her ignorance. President Bush will probably never even understand the true cost of his own ignorance, let alone pay the price. I am honored to report that Amanda of It's All About the Walls has nominated me for a new award called the Power of Schmooze Award. The purpose of the award is to reward bloggers who not only blog but also participate in a conversation with other bloggers, creating new communities. As a result of a quick Google search, I believe I have found the origin of this award, from a blog called Ordinary Folk. The author, Mike, and another blogger, Danielle, who writes the blog Pink Reviews apparently made this new award up. And I think it's a great idea. When you're a new blogger, as I am, there is still such a thrill to see that you have new comments on one of your posts. It shows that not only are people reading what you wrote, but they actually care enough to comment or respond to the ideas being presented. I don't know whether that ever loses its novelty. So, without further ado, I am happy to now pass on this award to other great bloggers who are also faithful commenters. Of course, my first has to be Ruth of Me, My Life, My Garden. Ruth was probably my first commenter and has been one of my most faithful blogfriends ever since. She has several blogs, many of which feature her beautiful photographs of her garden, and chronicle the details of her life. Ruth has blogfriends from around the world. I'm also happy to nominate Evil Spock of The Needs of the Few. His blog features posts by himself, Tootie the Uber-Tribble, Ensign Redshirt, Lt. Marlena Moreau, Medusan-in-a-box, and The Collective, as well as The Sophie. Evil Spock and The Collective are running for President and Vice President in 2012. Evil Spock has been a very loyal commenter on my blog and responds to all comments on his as well. An excellent schmoozer! "M" of m's blog is another great schmoozer - she posts prolifically and comments on others' blogs and responds on her own. She also authors a great blog about my favorite area of the country, the San Francisco Bay Area, called Bay Area Love Letters. I'll stop with three for now! There are lots of other great schmoozers out there (Hi Larry and Tomcat!) but I might have to pick some other blogs in the future - maybe "great political bloggers" perhaps? Hmmm, anybody know if there is an award for that out there? If not perhaps we should invent one. Thanks again, Amanda, and congratulations to the new nominees! We have had a hard week. First we took Diva in on Monday for her surgery to remove what turned out, thankfully, to be a benign cyst. We had been given a collar for her to wear but she hated it so we took it off and just kept an eye on her. DH stayed home with her on Tuesday, and on Wednesday we left her home alone. She managed to pull out one of the stitches that day but I didn't panic, because it was only one, and the rest of the wound was securely closed. So I put a Band-aid on it and we all went to sleep. This was Wednesday night. Thursday morning after breakfast I turned my back on her for all of five minutes and when I looked at her again she'd gotten all the stitches out! She knows what she is doing, don't you think she doesn't. We've scolded her enough times if she starts licking her leg. So she acts all innocent while we're watching her, but then when our backs are turned, her little dog brain must say "Aha! They're not watching me! Time to remove these annoying things from my leg!" So I called the vet where she's been having these surgeries done (which is also the Emergency Clinic at night, so they are well-acquainted with us!). They told me to bring her in and they'd put in staples this time. I had been all set to go to work, but this put a monkey-wrench into that plan. Luckily I have an understanding, animal-loving boss. After bringing Diva home, with yet another Elizabethan collar, I worked at home the rest of the day, and stayed home with her on Friday as well. All went fine until today. She'd been totally ignoring the stapled portion of her front leg today - we were thinking it must be healing up by now so were less concerned. We still didn't let her out of our sight, though. Then I made a crucial error. I went upstairs to take a shower, while DH decided to go run a quick errand. He didn't realize I was taking a shower, and I didn't realize he didn't put the collar back on her. Ten minutes later, I went downstairs to see what she was doing...and wouldn't you know it - all but one of the staples had been thoroughly removed and were on the carpet. And the cut was opened up all over again. I called the vet's again, they said bring her in again. And you have to understand this place is a good 20 minutes away by highway! A lot of back and forth has been occurring here. So, once again, Miss D made an appearance at the clinic, where she was welcomed by all. The doctor told me everyone loved her so much they were fighting for the privilege of taking care of her in the back. After a half hour, they brought her back out. I had asked for a slightly smaller collar that would be less annoying to her, and she came trotting out wearing it, and proudly displaying her newly-restapled front leg. That collar is not coming off for any reason whatsoever, except to eat. We have learned our lesson! I am honored to report that Kuanyin of Who's Yo Mama? recently nominated me for a "Rockin' Girl Blogger" award! Thanks so much, Kuanyin! And, as is the tradition, I will now nominate some others that I feel deserve this award. I know I've already nominated some for the Thinking Blogger Award so this time I'll try to pick some other blogs you may or may not have noticed on my sidebar. The first is Inside Betty's Head. Elizabeth's blog is beautifully written and her subject matter always worth reading, as her observations and stories are full of insight. Rhea of the The Boomer Chronicles writes an entertaining blog that any Baby Boomer will relate to, and everyone will enjoy. Her blog is updated daily and her subjects are always interesting. Third is Miss Doxie. Many of you may already know that Leigh has three adorable dachshunds (hence her blog's name), a boyfriend named Dukay, and humor to spare. Her dad recently was seriously ill so she has not posted since late June, but you can entertain yourself for days in her archives until that wondrous moment when she posts a new entry. Be careful if you're reading at work, as most of the time her blog will make you laugh out loud. Sometimes, though, you may cry. Both are difficult at work. And please, keep her dad in your thoughts. Also...there is a new post on Medicana if you'd like to check it out. Today I called the vet with trepidation to find out whether Diva's biopsy results had come back, from the little bump she had taken off her front leg on Monday. I always casually think, "Oh, I'll call them rather than wait until they call me, that way I'm mentally prepared." But despite the "preparation," or maybe because of it, I get that sinking feeling of dread in the pit of my stomach as I'm waiting to be connected to the doctor. It's the unknown - until you know the answer, you expect the worst. At least I do. I had my mind all scrunched up awaiting the blow to come: "I'm sorry to tell you but this new tumor is a Grade 2..." or heaven forbid, Grade 3. Or that they didn't get it all. But instead, the doctor said cheerfully, "Good news. Diva's biopsy showed it was just a little cyst." Nothing to worry about. Amazing. It hadn't even occurred to me that the bump would not be some grade of mast cell tumor, with the history she had had. And it looked JUST like the other two that were mast cell tumors. But that is the weird thing about this type of tumor - they can look like anything. So, it looks as if we don't have to give her any chemotherapy after all, at least not this time. But I'll be keeping my eye out, staying vigilant, making sure no new bumps go unnoticed. As a hypochondriac, I catch things early, because outcomes are better that way. So I'm being a hypochondriac on behalf of my dog for the same reason. Luckily, Diva is oblivious that anything is ever wrong in her little life. She loves going to the place where we have had these operations done; she wags her tail at everybody, and is ecstatic to greet the vet assistant who comes to take her away. Despite the fact that the last two times she's been brought there, she goes to sleep and wakes up with a nasty sore place somewhere on her body and feels crummy for a day or so, it doesn't stop her from loving to go see those people the next time. Dogs are truly able to live in the now. We should all be so lucky as to have their "live for today" attitude. I read an interesting column by Peggy Noonan in the Wall Street Journal yesterday. She used the example of a poor woman she met on the street handing out advertisements, who did not speak English, to bring up some very interesting points about the importance of our country having a national language. She wrote, "We must speak the same language so we can hearten each other." It is an interesting thought - rather than the jingoistic mantra of the neocons, "We should declare the national language to be English because if you come to this country, you darn well better speak our language!" she is looking at it from a humanistic standpoint. Ms. Noonan asks, "The real question, ultimately, is...should we allow America [to] devolve into a nation of two official languages--in this case, following recent demographic trends and realities, English and Spanish? We've never done that in more than 200 years. It would be radical, and destructive, to do it now." She rightly points out that other generations of immigrants before us have always eventually learned English and joined the mainstream culture. My husband's father grew up in Perth Amboy in a Polish immigrant neighborhood where the schools were taught in Polish. Born here, he easily learned English but can still speak Polish to this day. The advantage English has, and the reason it will always be the single common language in this country, is that it is a language that can absorb and incorporate the best of other languages. As Ms. Noonan noted, "Italian immigrants knew two languages, English and Italian. They enriched the first with the second--this was a great gift to all of us--and wound up with greater opportunities for personal communication to boot. Talk about win-win. And so with every group, from every place." I have no fear that the current Spanish-speaking immigrants won't follow this same pattern. It's a pattern that has existed since the birth of our nation. Just because today's current immigrants happen to be speaking Spanish and people are seeing signs in Spanish in the immigrant neighborhoods does not mean we are devolving into a nation of two languages. I am in the market research field and have observed focus groups with Hispanic mothers, conducted in Spanish (with a translator, since, alas, most of us marketing types are not fluent in Spanish). Time and again, these mothers have talked about the fact that although they don't speak English well since they came over to the United States as adults, their kids are already speaking it fluently and are bringing home American customs and idioms and incorporating them into the household. The mothers complain that oftentimes the children refuse to speak Spanish, so the mother will speak Spanish to the child and the child will answer in English. Their children, like all previous children of immigrants, are going to slide into the mainstream as all have done all along. There is no need to make English the "official" language of the country as some politicians wish to do. The reason for this is another thing that Ms. Noonan points out in her article. English is the language you need to succeed - not just here in the United States, but throughout the world. In the original Star Trek series, they all spoke English. In order to explain this phenomenon (given Gene Roddenberry's propensity for encouraging diversity and equality) the writers did not call it English. They called it "Standard." As in, "Do you speak Standard?" And Standard it is. If people from different countries who do not know each other's language meet, what do they speak to communicate? English. What is the international language of business? English. What is the one foreign language taught in schools all over the world, more than any other? English. I even know a man who immigrated here from India, who later married a woman who came over from India and did not know his particular Indian dialect. They speak English to communicate. Part of this is, of course, because America, arguably the most powerful nation in the world - at least for now - does not encourage schools, parents and kids to learn, fluently, other languages. That is partly because it's so hard to decide on one that would be useful, since there are so many languages to learn. But surely, Spanish, at this time in our history, would be the one to teach, so that, as Ms. Noonan says, we can "hearten each other." Communication is extremely important, and while these latest immigrants to our country are gradually integrating into our culture, it wouldn't hurt us to learn their language too, in order to reach out a helping hand to bring them aboard. This does not mean we're adopting a second language for our nation, just that we're making the effort to communicate so we can all understand each other better. 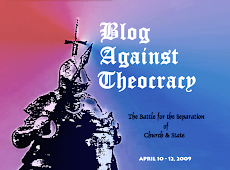 This is the second time I've participated in the Blog Against Theocracy blogswarm. 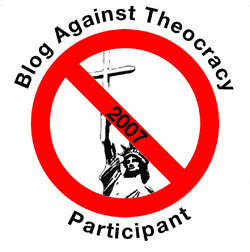 This time the participation dates were July 1-4 in honor of this country's independence, to show that being against theocracy is a patriotic stance to take. Since it is 9:43 on July 4th, I'm getting this in under the wire. Today, as is traditional, the New York Times published the Declaration of Independence in full. My husband read it out loud, and as always we were touched by the bravery of the men who signed it, knowing full well that if the British caught them, they would be hanged as traitors. The document is written so beautifully, spelling out one at a time the various transgressions that King George had perpetrated against the colonists. Interestingly, many of these actions are being taken by the government we have today. It makes me wonder whether it is time for a new revolution. Those who favor the intermingling of religion with our government love to use the Declaration of Independence to prove that the Founding Fathers believed in God and were religious and assumed all of the people in the country would agree with them on this point. They point to Jefferson's use of "Creator" in the document and use it as a point in favor of allowing religion to permeate all aspects of the government. But they are wrong. It is not the Declaration of Independence, important though it is, that spells out the rights and privileges of United States citizens. No, it is the U.S. Constitution that has this task. The Founding Fathers didn't want the government messing with people's religions. They didn't want the government to be in the God business one way or the other. If they wanted to put God in the Constitution, they easily could have mentioned it. On the contrary, they obviously went to a great deal of trouble to leave God out of it entirely, since his name in any of its forms is not in the document. Many of their ancestors had come to America for religious freedom, escaping from countries where there was one state religion and if you didn't follow that one, you were out of luck. They didn't want the same thing to happen in this new republic that they were founding. They didn't want people who practiced a less common type of religion to feel left out, persecuted, or uncomfortable because they were not in the majority. 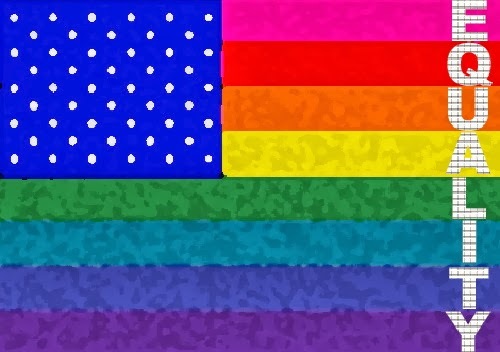 It was one of the principles on which this country was founded: the freedom to be yourself without fear. Despite the clear directive of the Constitution, Christianity has been the mainstream religion that permeates our lives, whether we believe in it or not. In recent times, more efforts have been made to try to eliminate religious expression from government-related events and locations in order to prevent minority religious groups from feeling excluded from the public discourse. And who howls in protest about this, claiming their right to religious expression is being denied? You guessed it: Christians. The largest religious group in the country, with countless churches, millions of members; the group with television and radio shows proclaiming their beliefs; the group whose holidays completely take over the public scene. Yes, them. They say their religious expression is being denied because their town won't put a creche scene on the town hall lawn at Christmas. Never mind that the town has a Christmas tree lighting and Santa Claus greeting the kids. Gotta have that creche scene or else their rights are being denied. The problem with these people is, they don't have any conception of what it's like to NOT be the mainstream religion. They don't know what it's like to be the only Jewish kid among a group of kids celebrating Christmas. Or be a Hindu person at a Democratic fundraising breakfast who has to hear someone say a prayer that invokes "Our Lord Jesus Christ," with the smug assumption that Jesus Christ is the Lord of everyone in that room. They have no idea what it feels like to not be the majority, to have to roll with the punches and smile as someone else's culture and beliefs are shoved down their throats. They don't know what it's like to be a Muslim in this day and age and hear the sly comments and whispers, or feel the prejudice. 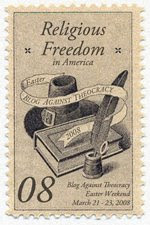 Freedom of religion means you are free to worship the way you see fit, in the church, mosque or temple of your choice. It means no one will cart you away in a railroad car to a concentration camp for being Jews. It means that you don't have to hide your Catholic mass in someone's attic as they did in Amsterdam when the Protestants were in charge. It means you don't have to worry that someone is going to burn down your church. It means that you don't have to worship at all if you don't want to. It doesn't mean that you can inject your own religion into every part of public life just because you're the majority. As the saying goes, your freedom to swing your fist ends at the tip of my nose. If your desire to practice your religion in freedom impinges on the freedom of someone else then your freedom must be abridged just enough so that both of you are free to worship without feeling stifled. The only way this can happen in any practical way is to leave religion out of government. Sure, you could include every single religion in an opening prayer, but it would get pretty dicey when you add in the Druids and the Wiccans on top of the Muslims, Christians, Jews, Buddhists and the various other sects that exist in this country. I really think even the outraged Christians would agree not promoting any religion is the easier solution. In case anyone wonders, my mother was brought up Protestant, my father was Jewish and converted to Christianity. I was raised Protestant (Congregationalist/United Church or Christ). I now consider myself an agnostic. I don't say I'm an atheist, because, as the New York Lottery says, "Hey, you never know!" But I do admire people who follow their religion and who sincerely believe. I often wish I had that ability but I'm a born skeptic and although I've tried in the past, I never can get rid of that little nagging voice of doubt. However, if I had been able to achieve true faith, I still don't think I'd have felt a need for my religion to be included in public events and on public property. I feel religion is a personal thing, to be celebrated in the company of your fellow worshippers, or alone. To me, that is freedom to worship as you please--and it should be enough. In honor of the holiday I'm posting JibJab's latest production. I think you'll enjoy it! I remember when I was young, my father, who was a medical advertising copywriter, used to go around the house talking about "floating anxiety." One of his clients was the company that made the tranquilizer Librium, and he often read his print ads out loud to my mother, who had also been a medical advertising writer before she had me and forever retired from the world of work. (Mind you, I realize raising me was also work. But it didn't involve getting up really early, showering, putting on a suit and high heels, and marching out the door every morning to catch a bus). Back to the anxiety. As you can imagine, growing up with two parents in the medical writing field, I got pretty used to the terminology. But sometimes things stuck in my mind. Floating anxiety was one of those things. It always sounded so ephemeral, a cloud of anxiety floating above someone's head sort of like that little raincloud that was always over the head of that character in L'il Abner (is L'il Abner even in the comics anymore?). It denotes the type of anxiety where a person doesn't really know why they're anxious; they just are. I often get this during the week when I have to go to work, or on Sunday afternoons when that late afternoon dread starts to mount. (Is there anyone out there who doesn't have this feeling on Sundays before a work week? If so, please tell me what kind of job you have so that I can try to get one like it). Today I have anxiety -- but it isn't officially floating. It has a cause. I noticed that Diva has another bump on her "arm." The same "arm" that had to have a bump taken off it back in March. I am already sure that it is probably yet another mast cell tumor and will have to be removed. For those of you who may not have ready my earlier posts, Diva has now had two Grade 1 mast cell tumors removed; one from her shoulder and one from her front leg. The latter one left a nasty scar since she could reach it to lick off the stitches. And this new bump is only about a centimeter or two away from the scar. I wonder whether it is actually a recurrence of the one that was removed, or a new one. The good news is, it is probably another Grade 1 (least aggressive) tumor. The bad news is, being the third one, she would probably have to have some chemotherapy (in pill form) to try to slow down the next one from popping up. And of course, she would once again have to go under anesthesia and have another nasty cut on her arm that has to heal. I am also concerned because the location may make it more difficult to remove all the tissue because it is right next to the first scar. I feel as if we're playing "whack a mole" with these things. You get rid of one, and another one pops up. How many times can the poor dog go through this? I didn't do anything about it today. Tomorrow is a holiday so probably the vet would not be able to see her until later this week anyway. I want to talk to the oncologist and see if she recommends a needle biopsy first, or whether it would be best to take her in for the full surgery given her history. I just can't deal with it at the moment. Diva is her usual happy, healthy, lively self, and it's hard to imagine this miniscule, almost unnoticeable bump could possibly kill her if we don't remove it. But I have to remind myself that it could. And deal with it.